SOBA Noodles are SO GOOD! You can buy dried Soba at your grocery store, just like pasta, but if you want to get creative in the kitchen you can try making your own out of buckwheat flour & water. Maybe someday I will be that ambitious, but for now I buy mine. Did you know that Soba noodles aren’t just another delicious form of pasta, but that they are crazy good for you too? so they can stand alone as a healthy meal choice and won’t leave you with a belly bloat like traditional pasta. I totally love carbs but they rarely love me back, and Soba noodles are a great way for me to get my pasta fix without feeling guilty! Soba can be served hot or cold in literally any way that you can imagine! 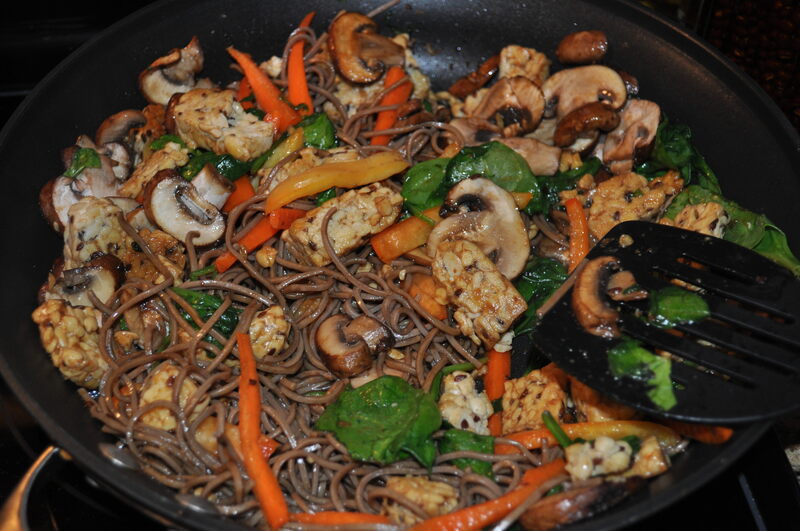 Below is my favorite way to eat Soba noodles and it is so seriously delicious! – but you can get creative! 1. Start by mixing all of the ingredients for the sauce in a large mixing bowl I pick a big enough bowl to use as my final mixing bowl once the noodles are done – less dishes = win & you don’t leave any yummy sauce behind. I usually make this sauce a little early and let it sit for 20 or so minutes because the flavors really get better the longer it sits! 2. Chop your veggies into bite-size pieces and lightly stir-fry (or steam) your veggies before you start cooking the noodles, because the soba only takes a few minutes to cook and you want everything ready to go when the noodles are done. I usually steam my veggies because I get lazy and hangry (hungry+angry), but the dish is super yummy either way. If you stir-fry your veggies, leave them in your wok until the noodles are ready and use the wok as your mixing bowl at the end – trust me! 3. Once you’re ready to cook your noodles – bring water to a boil and throw the soba in. Soba only takes a few minutes (maybe 5) to cook through so don’t get distracted or take a dance break like I usually do – they will overcook! Strain the noodles once they are done, and add the noodles and veggies to your mixing bowl full of sauce (or add sauce & veggies to your wok). Toss it all together and mix really well so that the sauce coats the noodles well. This dish is a great side or stands alone well as a meatless meal. Usually I eat it on its own because it is so yummy that I wouldn’t eat whatever else I made anyways. I also like to make extras of this meal because it makes super amazing leftovers! I swear this sauce only gets better with time! Would you try Soba noodles as a pasta alternative? Already love Soba? 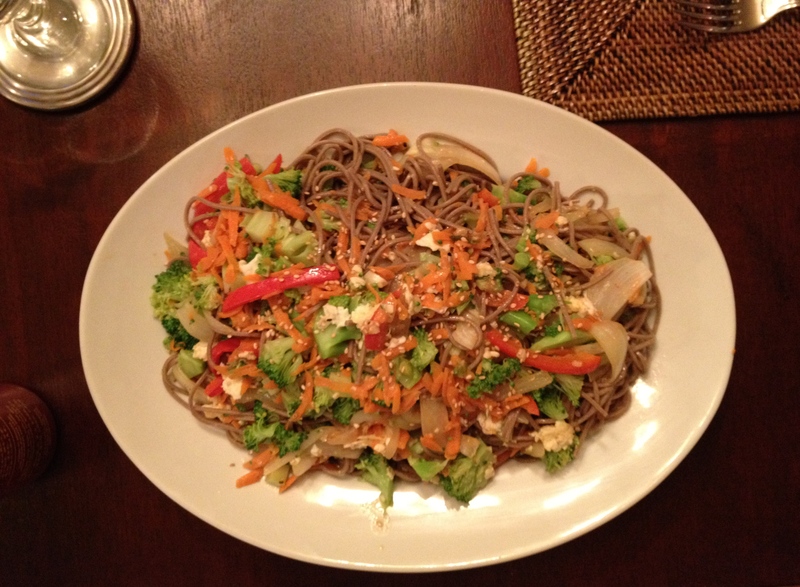 Leave your favorite Soba recipes in the comments so I can try them too! !